"Through the Glass Brick, No. 2" is a digital image which is what I call "second generation" PiCassieO, because the original print that it came from misfired in the printer. The part that printed was placed behind a glass brick that I use as a viewfinder and was then photographed, resulting in a totally different image. 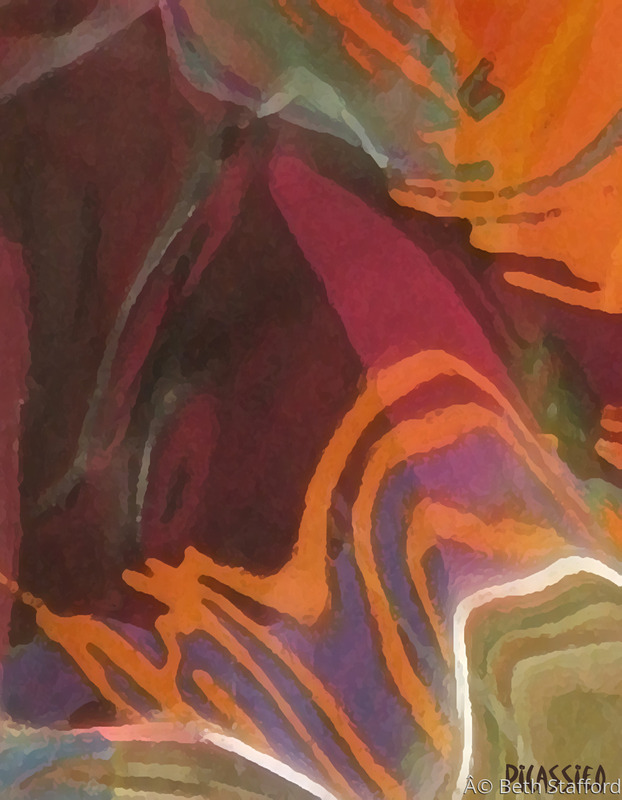 This particular print is actually an abstract from one of these "Gen - 2" prints that I called "Safari". There is still a shadowy jungle-like atmosphere, but the rich colors and graceful lines are the main subject here. The image is centered on 8.5" x 11" archival paper, with an adequate border for framing and is numbered and signed "Beth Stafford" on the bottom border. This is a limited edition of 50 prints. Unframed $30 plus $5 S&H - to order, click on "Contact Artist" below. I am including a view of it matted and framed in a standard metal frame with plexiglass. Print should be displayed under UV-resistant glass or plexi, away from strong sunlight or fluorescent light.